Each year, F.E. 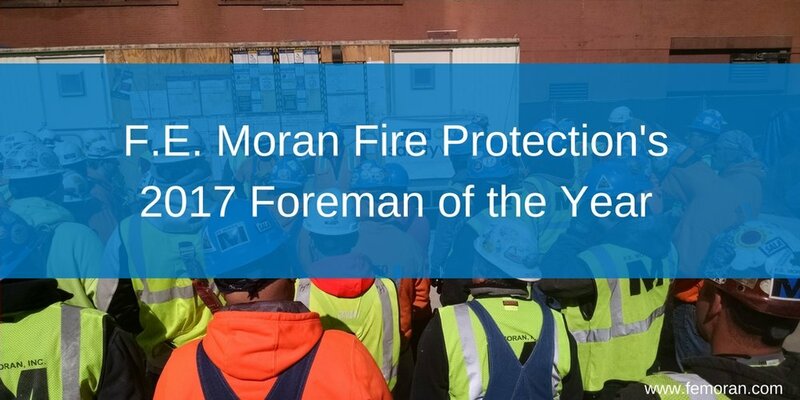 Moran Fire Protection National selects a foreman of the year who exemplifies the Moran Group's core values of excellence, integrity, loyalty, perseverance, humility, and courage. For 2017, F.E. Moran has chosen Kirk Cyrulik. "I am very grateful to win this award. Thank you to all who were involved in the process of reviewing my work ethic. I take a lot of pride working for F.E. Moran and am very happy to win this award. It's nice to know that our president and supervisors in the office recognize the hard work and extra Foreman's responsibilities to make jobs work! Thanks again." Safety Director, Jason Galoozis helps choose the foreman of the year by reviewing who has been consistent on safety documentation all year, including daily task hazard analysis, weekly safety inspections, and weekly toolbox talks. In addition, safety performance, productivity, and quality are major factors in making a decision on who gets honored with this award.